By William Mackay: Ricky Hatton is convinced that his close friend IBF/WBA light welterweight champion Amir Khan would give unbeaten Floyd Mayweather Jr. a lot of problems if and when they fight in the future. Hatton sees Khan’s hand speed and his in and out attacks as something that would cause Mayweather to struggle. However, Hatton is wise enough to see Mayweather still beating Khan, but he thinks it wouldn’t be easy. I completely disagree with Hatton here. Mayweather easily beats Khan right now. That may chance if the fight gets made in five or six years, but for the next four years, I see Mayweather knocking Khan cold. Khan has been matched softly since his fights with Breidis Prescott and Marcos Maidana. I don’t see any improvement in his game whatsoever. All I see is a fighter that’s been put in with guys like Paul McCloskey (no power), Zab Judah (old), Oisin Fagan (slow and no power), Paulie Malignaggi (no power), Andriy Kotelnik (no power), Marco Antonio Barrera (old), Dimitry Salita (slow). In his next fight, Khan is being matched up with another light hitter in Lamont Peterson. You think that’s by accident? Khan is the same fighter that was staggered by Maidana and knocked out in one round by Breidis Prescott. The only difference now is he’s being much more carefully matched now. Mayweather beats Khan seven days a week, 365 days a year. Khan would run the entire time and try to steal rounds with flurries. 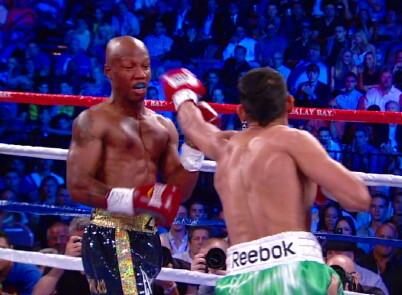 He’d get picked apart by Mayweather, who find major holes each time Khan opened up with a flurry of shots. Khan can do that kind of thing against limited, old or slow fighters, but against a quality guy like Mayweather, Khan would get knocked out if he tried to throw flurries. And he couldn’t beat Mayweather throwing jabs alone. You got to have more than that if you want to compete with Mayweather. I think Hatton is so far off in his estimation of Khan’s talent that he really needs to step back and rethink who Khan has been facing. « Klitschko vs. Mormeck: Will Wladimir carry Jean Marc to the later rounds?